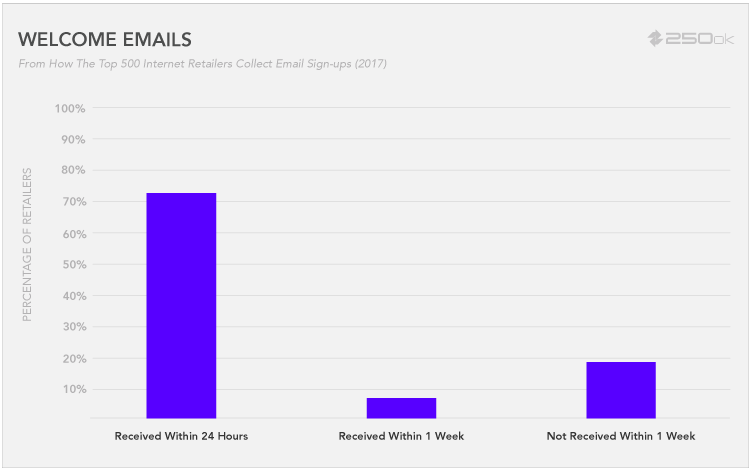 We’re back for year three of How the Top 500 Internet Retailers Collect Email Sign-ups (2017), where we analyze the email sign-up process of retailers, including how they incentivized sign-ups, what personal data they collected, and more. Included in this blog will be trend comparison over last year’s How the Top 500 Internet Retailers Collect Email Sign-ups (2016). Before we get started, did you know half of Americans are now Amazon Prime shoppers? Or that 43% of all US online retail in 2016 went through Amazon? The National Retail Federation forecasts nonstore sales will grow 8-12% in 2017, compared with a projected 3.7-4.2% growth rate for the retail industry as a whole (excluding gas stations, automobiles, and restaurants). Consider how important email marketing will become in the years ahead as the brick-and-mortar revenues continue to be cannibalized by online sales. More than seven in 10 consumers—72.5%—chose email when asked about their preferred method of communication with a brand, so no meaningful change since last year. Add in the 11% who want a mix of email and SMS, and the number of consumers that want email climbs to 84%. Among the three age groups tracked, Gmail was the dominant mailbox provider for ages 14-19 (83.5%), 19-34 (77.3%), and 56-67 (42.5%). Even among boomers (ages 56-67), Gmail usage dramatically increased to 43% this year, compared with 28% in 2016. And in case you missed it, Google announced Gmail had more than one billion active users in February of 2016. Gmail attributes no value to email certifications services, including those offered by Return Path, when making their email deliverability decisions. At what point do certification services become pointless for most senders? The Adestra survey revealed an average of 3.2 personal email addresses per respondent. About a third (34.1%) of older consumers reported the use of a secondary email address for “junk email,” with nearly three-fifths (57.4%) of younger consumers doing so. What do consumers expect when signing up for marketing emails and what kind of experience are retailers providing? 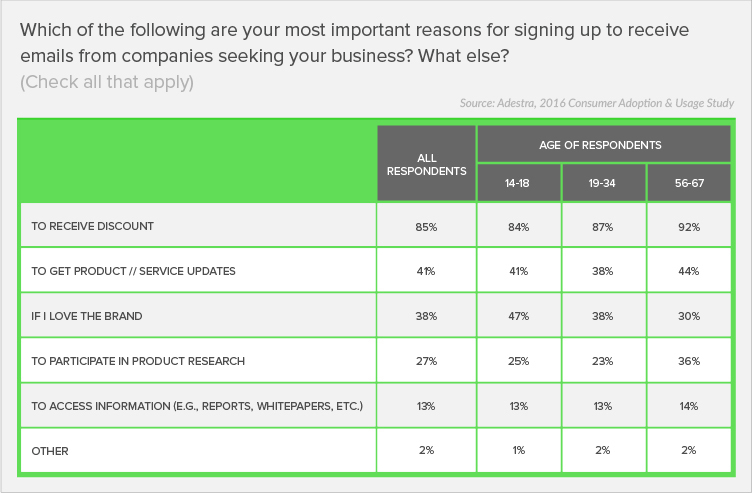 According to Adestra’s 2016 survey, 85% of those surveyed signed up to receive discounts, get product and service updates (41%), and because they love the brand (38%). For those consumers wanting promotion offers, the most popular types were percentage-off offers (35%), free shipping (20%), free trials (14%), and dollar-off promotions (14%). Our 2017 analysis revealed 48.3% of retailers incentivized consumers to sign up, compared to 38.2% last year. Of those offering incentives, the top three were percentage-off offers (59.7%), free shipping (18.7%), dollar-off promotions (13.3%), and sweepstakes (8.3%). 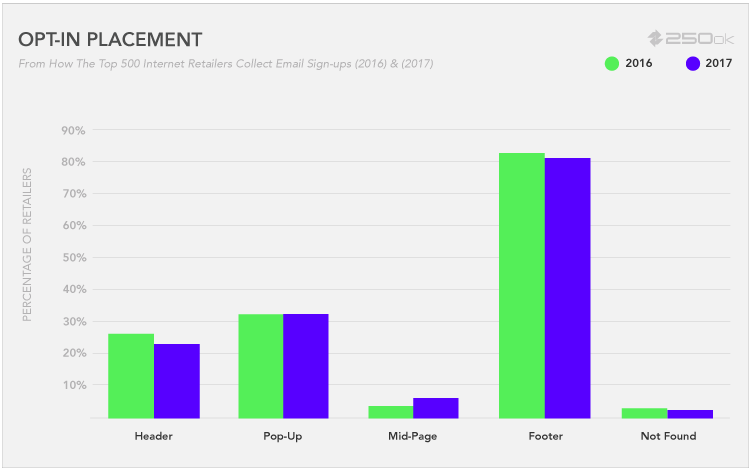 The most common stationary placement position for email sign-up is still the footer (80.4%), down from 83% in 2016, followed by the header (22.4%), and then mid-page (4.7%). The use of pop-ups came in at 33.3%, slightly up from last year’s 32.4%. Of those using pop-ups, the welcome mat was still the most used (68.5%) but saw much lower adoption than last year (82%). Other pop-up usage included timed (24.1%), scroll (6.4%), and the list builder (1.1%). For 1.4% of sites we visited, we failed to find a sign-up. 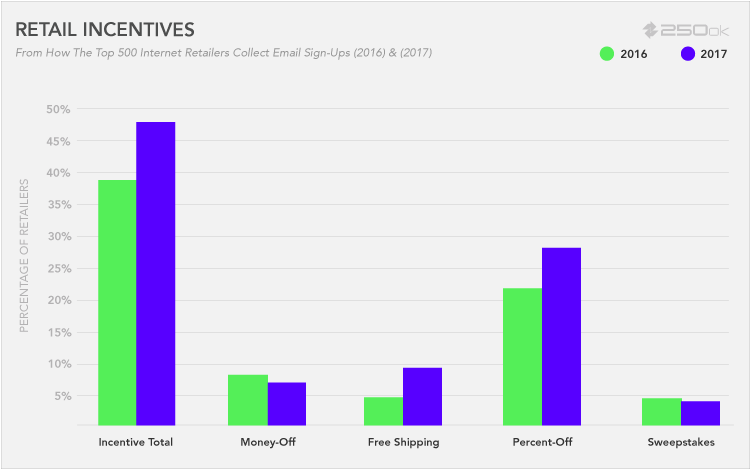 We discovered that of the retailers offering email sign-up, just under half (47.4%) used a single opt-in placement, with 30.1% using two, and 22.5% using three or more sign-up placements. 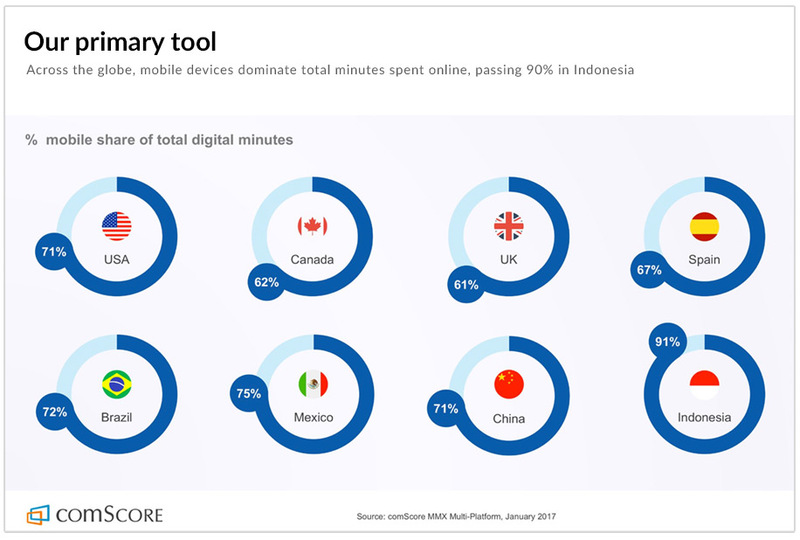 With the majority of a consumer’s digital minutes spent on mobile devices, we examined if top retailers optimized their websites for the mobile experience. The 2017 survey showed only 3.7% of sign-up pages failed to optimize for mobile, and improvement from 8% in 2016. Did you know 86% of US and UK marketers recently reported “more data” is the key to success? If not, have a look at the Kissmetrics blog on the positive impact personalization has on email success. 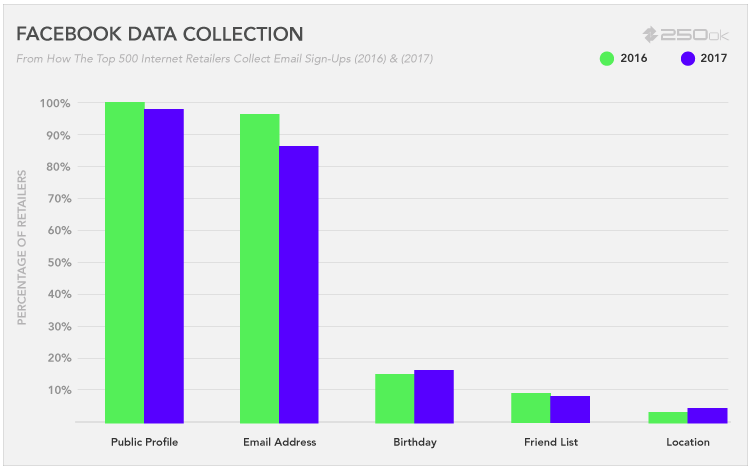 We analyzed what specific types of data the top retailers collected during their email sign-up process. 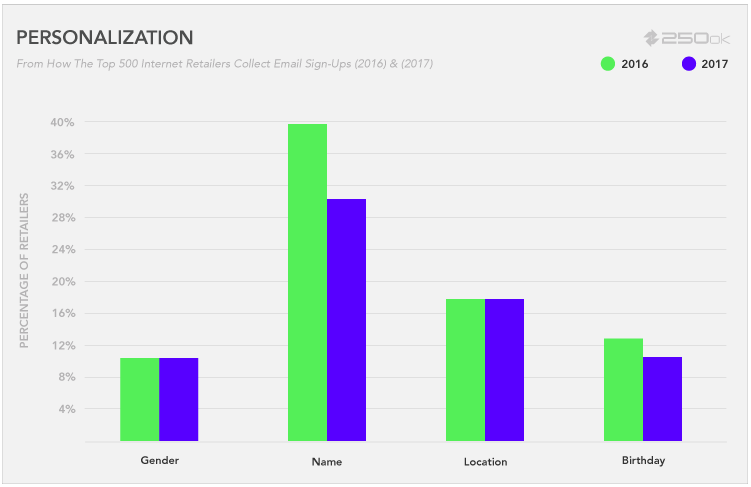 In the 2017 survey, we found only 29.5% of retailers offering email sign-up asked for a name, down 10% from 39.8% last year. Other types of data collection included location (16.8%), birthday (10.7%), and gender (10.3%). For all data points besides gender, which stayed flat, the request for personal information decreased year over year. 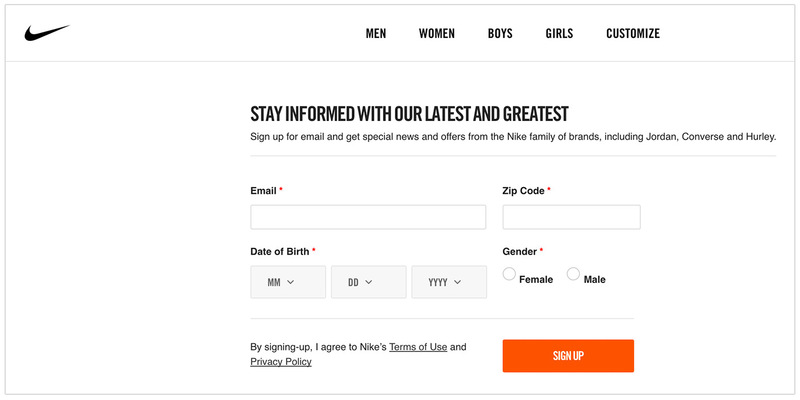 Some retailers allow consumers to sign up for emails via social sign-up. This approach allows consumers to use their profile from a social networking or other online services as a means to create an account with the retailer. 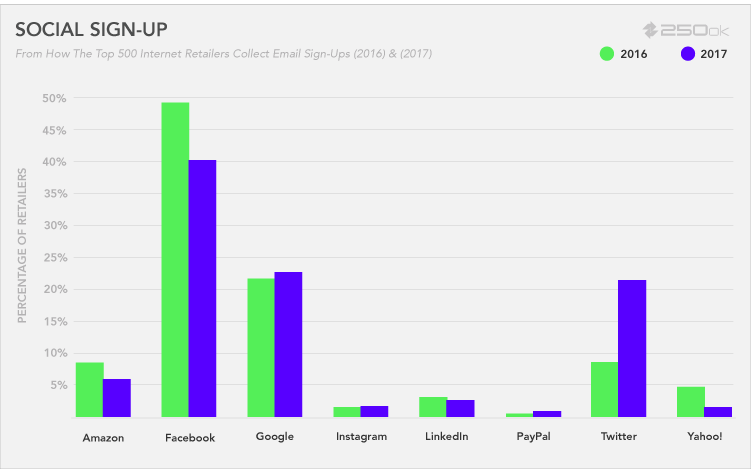 We found 29.5% of retailers that offer email sign-up allowed for a social sign-up, down from 34% in 2016. Of those offering social sign-up, we counted eight potential account types, including Facebook (40%), Google (23.5%), Twitter (22.9%), and Amazon (5.9%). Of note, Facebook was the biggest year-over-year loser with a 9% reduction, while Twitter grew from 8.7% to 22.9%. Google held steady with a less than 1% increase. 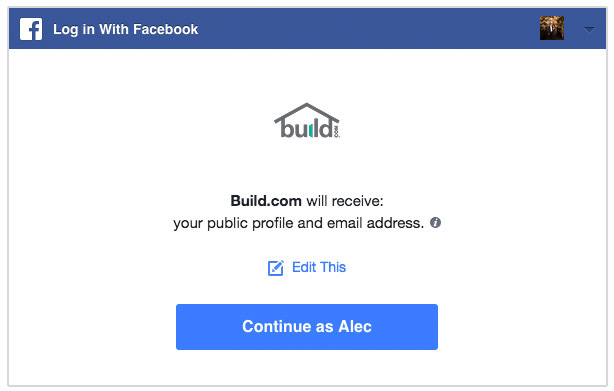 Out of all the methods of social sign-up, Facebook still rules. Through Facebook social sign-up, the most common request was for access to a consumer’s Facebook profile (98.6%). Surprisingly, we found only 86.8% wanted an email address through Facebook, a substantial drop from last year’s 97%. Other Facebook permission requests included access to a consumer’s birthday (16.2%), their friends list (8.9%), and their current city (4.4%). A small percentage of programs required double opt-in (9.1%), also known as confirmed opt-in. There was no meaningful change when compared to 2016. 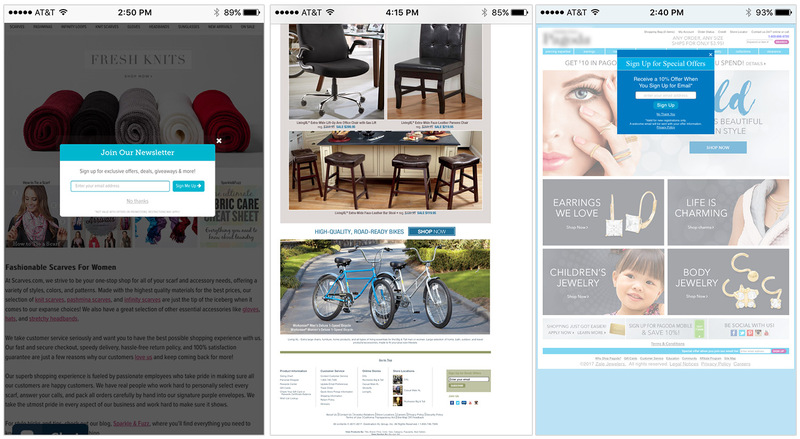 After signing up to receive marketing messages, we received the first email from 80.2% of retailers within one week. Of those messages, 72.9% of the first emails arrived within 24 hours after sign-up. Stay woke and be ready for a follow-up blog on How the Top 500 Internet Retailers Manage Welcome Emails (2017), a simple analysis of how retailers approach the welcome email phase of the recipient’s journey.